Introducing an Exciting New Format to Help Children 10 & Under Learn and Play Tennis! USTA Jr. Team Tennis now includes 10 and Under Tennis. The goal for participants is to enter on a team, learn on a team and play on a team. As with many other sports for these age groups, scaled down tennis is designed for their physical size and capabilities. The changes in court size, net height, racquet length, ball and scoring will help kids develop better technical and tactical skills. And when each of these elements are used collaboratively, kids will achieve success more quickly. 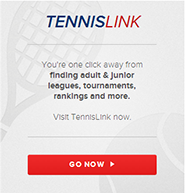 Click here to visit the USTA's 10 and Under Tennis website. Parent support and involvement is a key component to a successful USTA Jr. Team Tennis Program at all levels of play. Parents are needed to assist as “Team Managers,” and in many situations parents may serve as Coaches. The role of the parent volunteer will be more clearly defined by each participating site. Parent involvement on court for the 8 & Under Beginner/Intermdiate and 10 & Under Beginner/Intermediate divisions is quite different than every other level of play in the USTA Jr. Team Tennis program. In all cases, for these divisions, parents are needed to assist on court during match play. For both the 8 & Under and 10 & Under divisions, one parent (preferably not the parent for those players) should be assigned to stand at the net to assist on each court. Parents are needed to assist with scoring, however, players should be prompted to use the visual scoring devices to call the score before each point, and each new game. Parents may assist with line calls when players appear to need help. Parents should applaud good shots made by both players. For the 6 to 8 year-olds, the court dimensions are 36' long and 18' wide. Children play across the width of a normal tennis court, with a portable net or tape dividing the court in half. The length of the court stretches between the doubles sidelines. The width spans from the baseline to the service line. Temporary lines (throw-down lines, tape or chalk) can be used to mark the boundaries. Since the dimensions are smaller, as many as four courts can be set up across one full-size tennis court. The net height is 2' 9". For 8 & Under, a very low-compression ball (Red Ball) moves slower, bounces lower and travels less distance. For 10 & Under, a low-compression ball (Orange Ball) moves a little faster and travels farther than the ball used with the younger group, but it still has a lower bounce than a regulation ball. For 8 & Under, the racquet should be 19", 21" or 23"
For 10 & Under, the racquet should be 23" or 25"
For 10 & Under, best of 3, 4 game short sets to (first to 4 games wins the set and first to 4 points wins the game) with a 7 point game in lieu of a third set. Season should be 6 to 8 weeks long and consist of a weekly team practice and match. Practice and match play should each last about an hour. For most younger players, over an hour is too long, however, parents seem to like an hour, especially given their time to travel to the venue. For 8 & Under, 2 rotations of 4 singles matches, followed by 2 doubles matches will take about an hour. Rotations may be based on a formal line-up ( for example in 8 & under --1 vs 1 then 1 vs 2 then 1 & 2 vs 1 & 2), or based on first players to complete earlier rounds, or based on matching skill levels after each round is completed. For 10 & Under, 3 singles matches and 1 doubles match will take about an hour. Exhibition matches may be arranged to accommodate other teammates available to play. For 8 & Under, underhand bounce serve may be allowed to provide more success in getting the ball in play. Clothespins or other devices should be used to give the players a visual reference for keeping score. Match scores will be recorded, however, emphasis should be on etiquette and sportsmanship, not winning. Parent support and involvement is key to the successful development of the Jr. Team Tennis program. Parents, rather than area tennis professionals, should serve as Coaches/Managers for team matches. Parents may organize a snack schedule for weekly matches, as well as an end of season team party.